Darren McGarvey aka Loki invites you to come on a safari of sorts. A Poverty Safari. But not the sort where the indigenous population is surveyed from a safe distance for a time, before the window on the community closes and everyone gradually forgets about it. 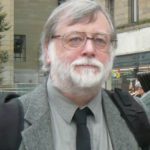 Drawing on his own experience of growing up in Pollok on Glasgow’s South Side, in Poverty Safari McGarvey powerfully delves into life in Britain’s deprived communities to call for urgent change. Four out of five have experienced alcohol or substance misuse problems at some point. Three have a criminal record. Three were suspended or excluded from school for disruptive or violent behaviour. Two have attempted suicide on one or more occasion. One has served a prison sentence for drug-related offences. Three have never voted in a general election. Five have experienced abuse and neglect at the hands of a care giver. Five took up full-time smoking at a young age. Five have received state benefits. Five have been in a dysfunctional relationship. Five have experienced health problems associated with poor nutrition and lifestyle. Five have poor concentration that has impacted on their education. Five suffer from social anxiety. Five have experienced emotional and mental health problems that predispose them to stress. Zero have gone to university. Zero are on the housing ladder. Zero have access to a bank of Mum and Dad. Zero are involved with an activist group. Zero are active members of a political party. Zero regularly visit libraries or places of cultural interest. Zero go on foreign holidays at least once a year. And none of us care for Radio 2, yoga or Quorn-based food products either. It’s a lot more striking when you think about it like that, isn’t it? Beneath the specificity and uniqueness of our subjectively experienced individual lives runs a road of pure inevitability from which we rarely diverge. Poverty appears to be the definitive factor that dictates the direction of a person’s life from the very day that they are born. Studies found it was possible to predict the odds that a child will ascend to the middle class, simply by measuring their birthweight. Babies born of parents who live in areas of high deprivation are more likely to be of low birthweight compared to babies born of parents who live in areas of average and low deprivation: 8 per cent compared to 5–6 per cent. We often discuss the issue of poverty as if it’s an entity that descends on communities at random and without warning. For some, poverty is a quicksand that consumes us despite our best efforts to escape its pull. The more effort we make to get out, the further up to our necks we find ourselves. For others, it’s a monster living on a distant hillside, a place where you should never go. All we can ever do, it seems, is stem the bleed as this unforgiving predator moves on to its next hapless victim. I can understand this kind of emotional disassociation. I am guilty of it too when it comes to issues I’m not in proximity to. Even though it bothers me, I can understand how people who don’t live in poverty might be detached from the struggles of those who do. The social and cultural divides are often so wide that all we can do is make assumptions, drawing inaccurate conclusions about people we rarely mix with. This disconnection, and the impact it has on our ability to think and discuss the matter, is a big part of the reason why poverty persists. Not only do we have gulfs in class to traverse, we also have divides in ideology, politics and individual and collective interests to consider. On the left, we believe poverty is a political choice, the effects of which could be alleviated if we were to redirect our collective resources to redistribute the wealth in our society. On the right, people believe that empowering the individual and the family to become prosperous, and reducing the role (and cost) of the state, is the best way to create a viable, socially cohesive society. Looming over this debate is an election cycle, mass media and a world of such unending complexity that our leaders often choose to oversimplify every aspect of our lives into soundbites. But the fault doesn’t always lie with those who remain unaware of the nuts and bolts of poverty, nor can it be pinned solely on politicians. Being sentimental, sensationalist or melodramatic about it doesn’t help either. And just because you identify yourself as someone who is poor or someone who is ‘fighting’ poverty, that should not absolve you from examining your own beliefs and assumptions about the matter as well. It’s far more complex than many of us would like to believe. 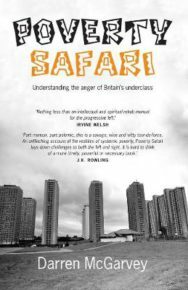 Poverty Safari: Understanding the Anger of Britain’s Underclass by Darren McGarvey is out now published by Luath Press priced £7.99.